Child's Play Clubs UK is an Ofsted registered organisation, providing children with never ending play opportunities before and after school. They have been really supportive of the GEM Project, initially offering a participant a bank staff position, which has subsequently evolved into a part time role. When looking to recruit a new member of staff, Child's Play Clubs came across a GEM participant candidate. In order to help them with the interview, they adapted their usual process to provide additional support and allowed their Navigator Developer to also attend the interview. After a successful interview, the participant was initially offered a bank staff position. Child's Play Clubs provided lots of support to their newest recruit, as well as the opportunity to shadow a member of the team to help provide an easy start to their role. However, since being offered the position, due to the participant's potential and progress within the organisation, they have been offered a part time job with regular hours, contributing even further as part of the Child's Play Clubs UK team. Hubble Bubble Coffee House is located on Westgate Street in Gloucester and provides brunch, lunch and their special "freakshakes" to customers. Their involvement in the GEM Project has enabled a participant to gain her first paid employment position. They have provided a range of different types of support to ensure their new employee felt welcomed into their team, despite having High Functioning Autism. Although previously the GEM participant would be invited for interview, she would never be offered the job, but with some adjustments from Hubble Bubble, including a buddy system for the first few months and a trial shift to get her used to the working world, she is now thriving and making excellent progress in her new role. 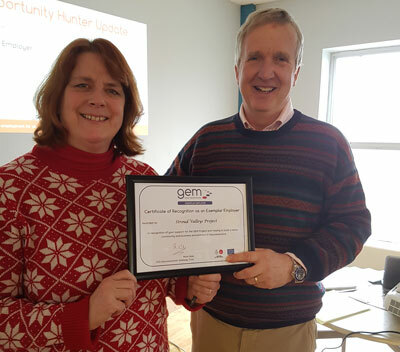 Details about the GEM participant's journey can be found on our Success Stories page. BCS, The Chartered Institute for IT, has within it's purpose 'making IT good for society'. They believe that it's important to provide support to all individuals, so were keen to support the GEM Project by offering a work placement to a GEM participant. 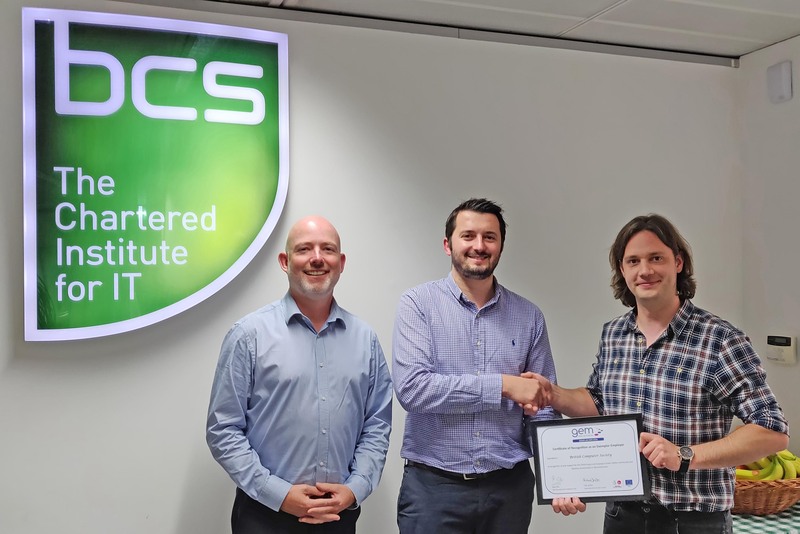 The participant, though suffering with social anxiety, completed a five month placement at BCS, helping with the successful resolution of many long-standing bugs and change requests across a range of BCS applications, which in turn helped balance the workload of the team and fix a number of issues. Ken from BCS commented "There is a huge amount of potential to be unlocked in people, and as employers we need to recognise that every individual has different needs in order to thrive. Julian’s help and experience has been invaluable to the team in helping us with a number of issues that we couldn’t have done without him. It's brilliant that following Julian’s work placement, he went on and found permanent work as a Software Developer." Emma Willis is a high end tailor and bespoke shirt and clothes maker in London with a factory in Gloucester. Emma supported the GEM Project by sharing sewing and cloth making skills with participants at the Friendship Cafe, and quickly realised that a number of refugees coming to Gloucester are skilled tailors, but with limited opportunities for their skills. She was delighted to offer pre-employment and then employment for two participants at her Gloucester factory. Emma said "I was inspired to try and find a position for Ibrahim and Nareen due to their country's crisis and the unimaginable impact on their lives, despite not having a need for additional technicians at the time. I am delighted to have them both - they are exemplary employees with exceptional talent in sewing and cutting - needing very little training with innate skills - quick to learn and dedicated." 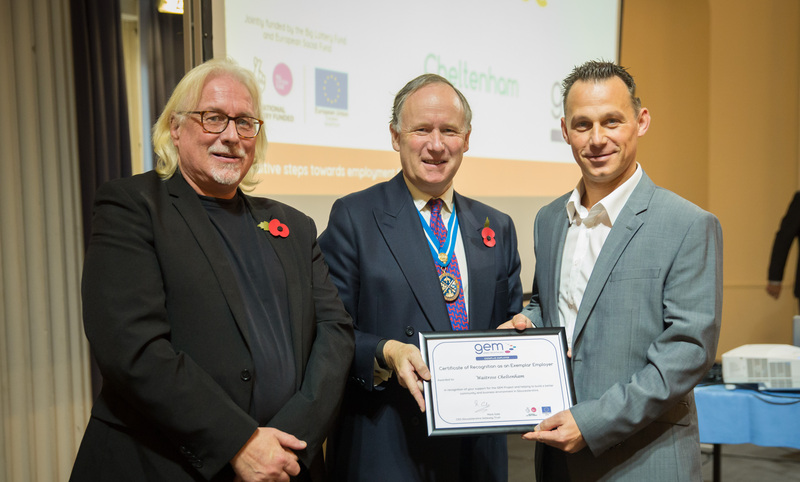 Cirencester Town Council have shown great support to GEM participants, offering opportunities to volunteer that have led to a full-time employed role for one participant. The volunteering roles covered events, stewarding, community work and customer service - allowing participants to develop their skills and greatly increase their confidence. One participant also worked within the gallery alongside The Churn Project and helped him to gain confidence in his personal presentation. Another participant has since been employed by Cirencester Town Council as their first female Groundsperson. The Forest Upcycling Project - based in the Forest of Dean - collects donated furniture from the surrounding area and sells it to raise funds and create jobs for vulnerable people. So far the project has supported 12 GEM participants, each benefiting from 1-2-1 support in an environment suited to their needs. Participants have been engaged in meeting customers when collecting donated furniture and working in the shops, as well experience working in the warehouse. One participant with a long history of unemployment and extremely low self-esteem had such a confidence boost through working on the project that she now has a part-time paid role supervising the project and enabling the shop to extend its opening hours. This meaningful work adds real value to a participants CV and references are provided to potential employers. 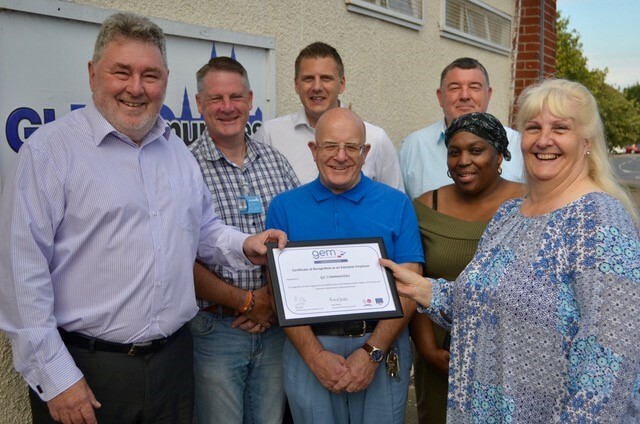 GL Communities works in Gloucestershire’s urban areas, supporting local community development, advice, education and training activities to increase residents’ confidence, skills levels and reliance - particularly for people who live with ill health, disability, caring responsibilities or unemployment. 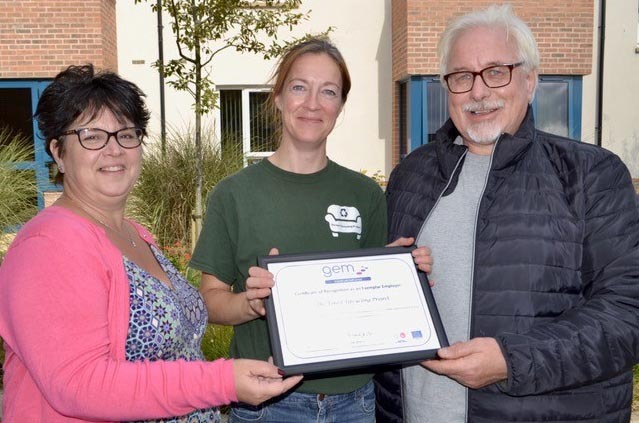 They have supported over 10 GEM participants on their journeys by providing them with volunteering opportunities in gardening, reception and admin work, and working in a charity shop, and have employed two participants in part-time roles. In addition, GL Communities has also provided financial inclusion training for a significant number and wide variety of GEM participants, which has been really well received. 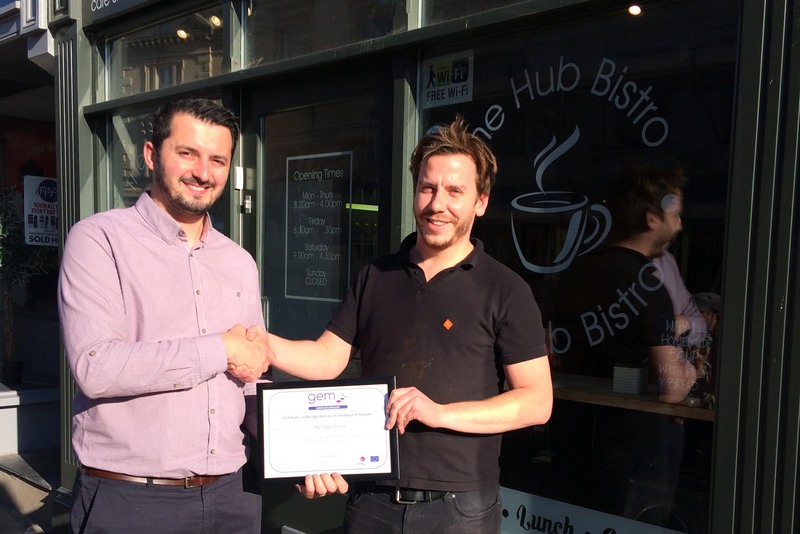 The Hub Bistro is a not-for-profit community cafe based in Gloucester City Centre, where the team is made up of a mixture of staff and volunteers including those who are in recovery from addiction issues, with the aim of being a final stepping stone for people wanting to get back into paid employment. At the Hub Bistro team has supported the GEM Project by providing several “Barista” training sessions in a calm, supportive environment. This has enabled the GEM participants to gain knowledge of the types of coffee served, how to use a commercial coffee machine to produce top quality cups of coffee. This, combined with the opportunity to engage with real customers, has increased their skill level and confidence to a point at which they feel able to make further progress. 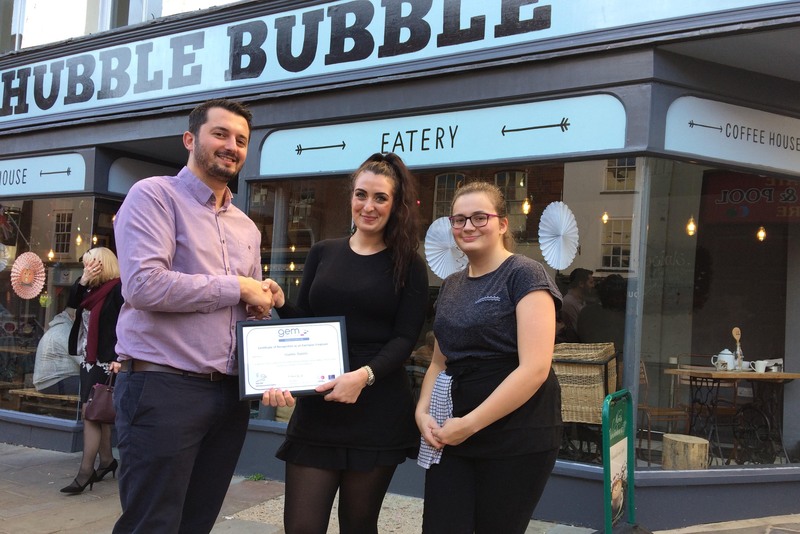 Following the training session, two GEM participants were offered volunteering roles in the Hub Bistro, and at the time of writing, the other participant had started to volunteer at The Schoolhouse Café in Cheltenham, awaiting an interview for a part time job there. Kingfisher Treasure Seekers (KFT) believes that there should be no barriers between a person and their potential, and they seek to help people become 'the best version of themselves'. Through their gift shop in Gloucester's Westgate Street, KFT have supported a number of GEM Project participants to gain valuable experience working in a retail environment, including serving customers. All participants have doubled their hours during the course of their time at KFT, which demonstrates their progress and the support of KFT as an employer. KFT also supported a participant in a wheelchair to achieve his goal of working on a till point independently by allowing him to adapt the till point by making a few small modifications, which made a huge difference to his experience. 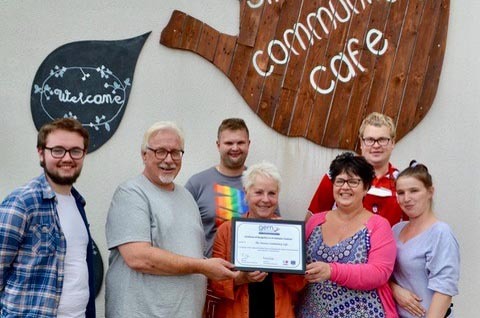 Sixteen Community Cafe in Coleford provides work experience and paid opportunities for people with learning difficulties and other disabilities. 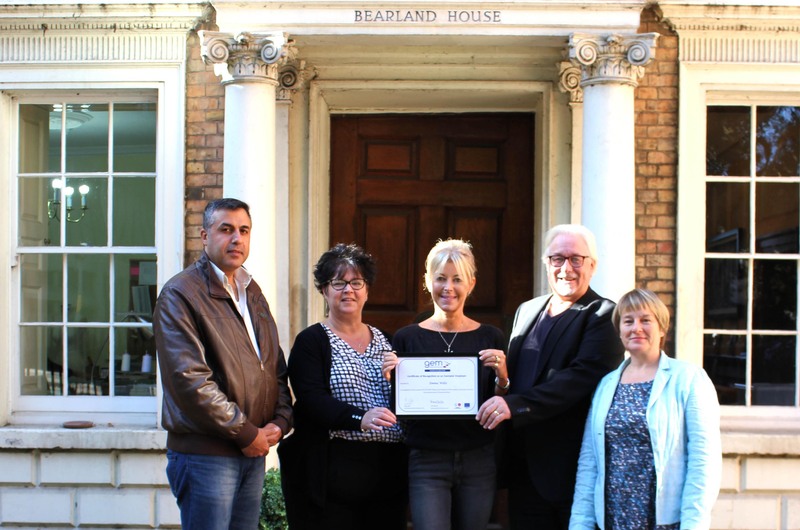 They have provided work experience opportunities for GEM participants which has included working front of house, food hygiene and preparation, cafe set-up and cleaning. This has really helped participants to develop their self-confidence and interpersonal skills, as well as catering experience. 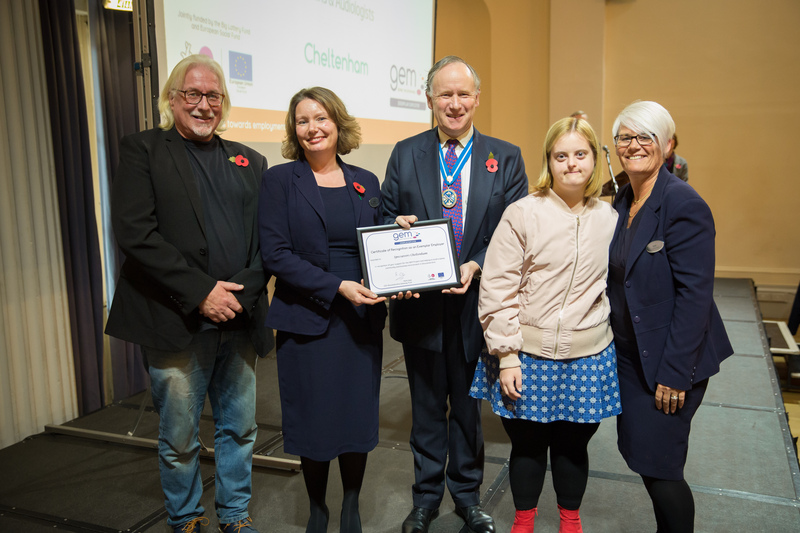 The GEM Project were delighted to award Sixteen Community Cafe an Exemplar Employer Award as they understand people who have complex needs and are readily prepared to make adjustments to create the best possible environment for the participant to flourish. 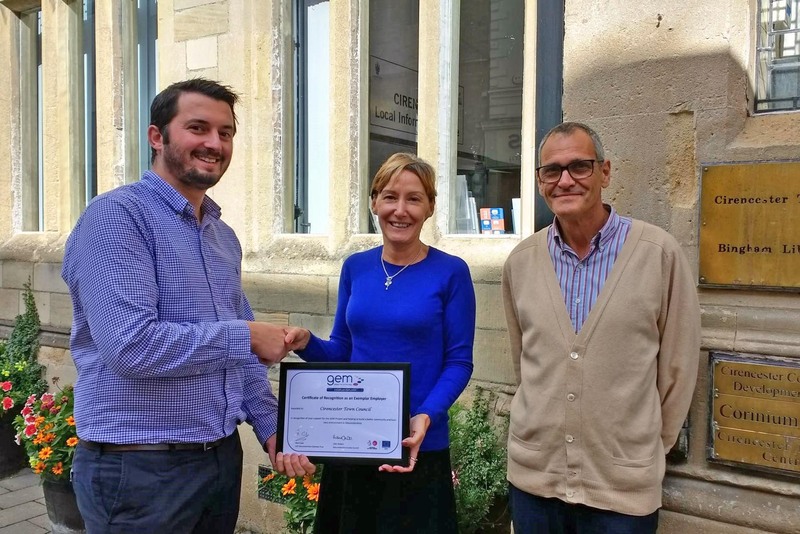 The Churn Project is another GEM Partner and provides support to the most vulnerable people in the Cirencester area, improving well being and isolation for local people. The Churn Project has provided several volunteering opportunities for GEM participants which has supported these GEM's with their development and skills to move forward. This has included a volunteer driver and peer mentor role to help other GEM participants enrolled through the Churn Project; along with a volunteer role in helping staff members with the Churn's Work Club as well as producing publicity materials. This has led to the individual's confidence increasing, which in turn has helped to secure a work placement position at the local town council. The Churn Project is another GEM Partner and provides support to the most vulnerable people in the Cirencester area. They have provided several volunteering opportunities for GEM participants which has supported these GEM's with their development and skills to move forward. Glevum Security provides security services for companies across Gloucestershire, from major corporate concerns to small family run businesses. They provided a work placement opportunity to a GEM individual to ease him back into working in the security sector after an injury resulting in serious mental fatigue. Glevum have also provided further training opportunities to this GEM individual to help develop his professional development and support him in the future with potential job opportunities. The full story can be seen on our GEM Success Stories page. 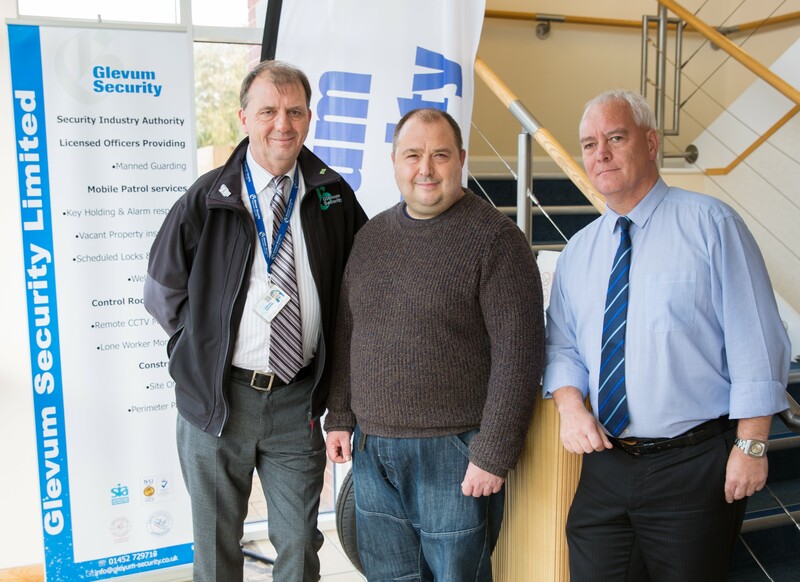 Glevum Security provided a work placement opportunity to a GEM individual to ease him back into working in the security sector after an injury resulting in serious mental fatigue. A GEM individual was given the opportunity to shadow several members of the Environment Agency engineering team, providing advice and support to hopefully help the GEM gain a job in civil engineering, particularly the water industry. The Environment Agency felt this enhanced their job satisfaction and gave their team the opportunity to reflect on their work methods and practices and look at how these could be improved. The Environment Agency in Tewkesbury provided the opportunity for a GEM individual to shadow several members of their engineering team. 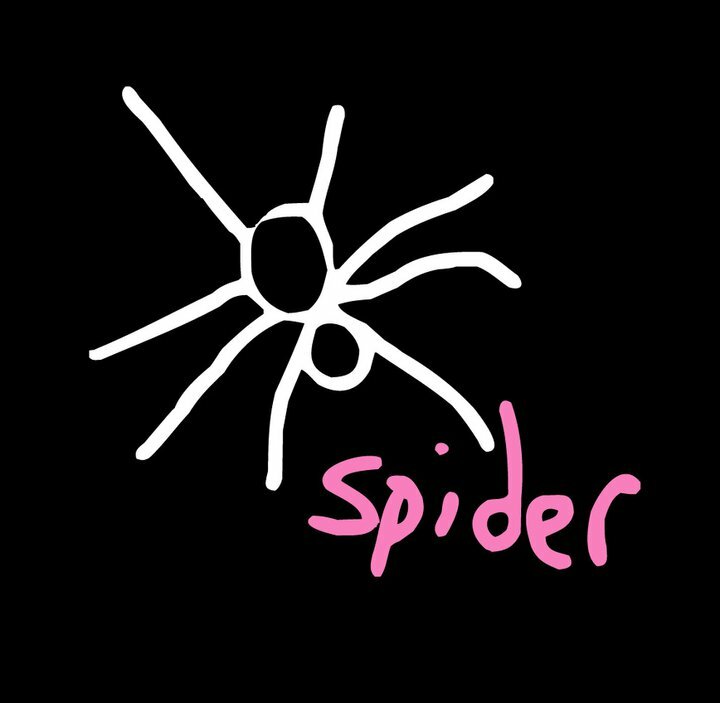 Spider Creative provides design and creative project management, ran by an independent design specialist Sarah. Sarah offered the opportunity for a GEM individual to volunteer as a studio assistant and in return, provided 1-1 mentoring to help them develop as an artist and take into consideration a long term career plan. "I strongly believe that people are worth investing in, especially when facing challenges and I have been delighted to be able to offer an opportunity to someone who clearly has talent and ideas. The studio has benefited by being able to allocate resources to tasks and helped moved some projects forward." Spider Creative offered the opportunity for a GEM individual to volunteer as a studio assistant and in return, provided mentoring to help them develop as an artist and take into consideration a long term career plan. Waitrose in Cheltenham have provided two mock interview sessions for GEM individuals, using their current interview process to provide a realistic interview experience but with added support and guidance when necessary. "It’s been a pleasure to be involved in this process and we will be looking to hold further practice interviews to support more people. It's even helped me, challenging myself with my interview techniques to ensure that I am clear, and my instructions are explained properly to be fully understood." Waitrose in Cheltenham have provided two mock interview sessions for GEM individuals, using their current interview process to provide a realistic interview experience. Since working with the GEM Project, Specsavers in Cheltenham have employed four GEM individuals. They are known in the store as the "fab four," with three GEM's working in the lab helping with quality control and the fourth supporting the administration team. Sarah O'Grady, Lab Manager: "I would definitely recommend the GEM Project to any organisation, it is such a good opportunity to help those who need help back into work. It has a made a huge difference to our store having these four GEM's working with us and they are all such a joy to have around." Since working with the GEM Project, Specsavers in Cheltenham have employed four GEM individuals. They are known in the store as the "fab four" with three GEM's working in the lab helping with quality control and the fourth supporting the administration team. 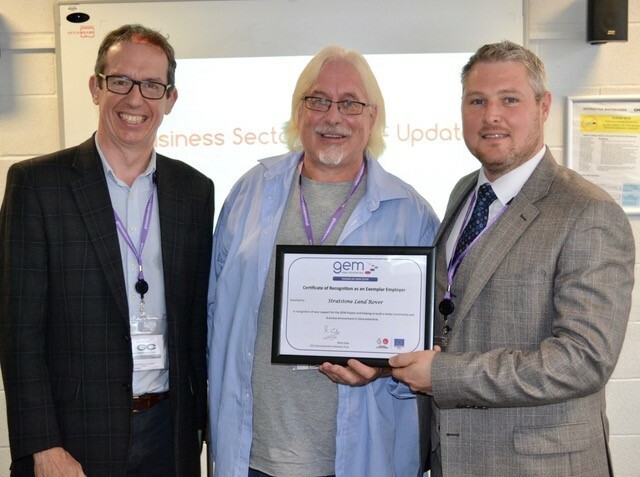 Stroud Valleys Project is the first GEM Partner to become an Exemplar Employer. Working for the environment to change lives and transform places, Stroud Valleys Project work with people from all walks of life. They have provided numerous volunteering opportunities for individuals on the project, including administration, marketing, fundraising and handyman positions. 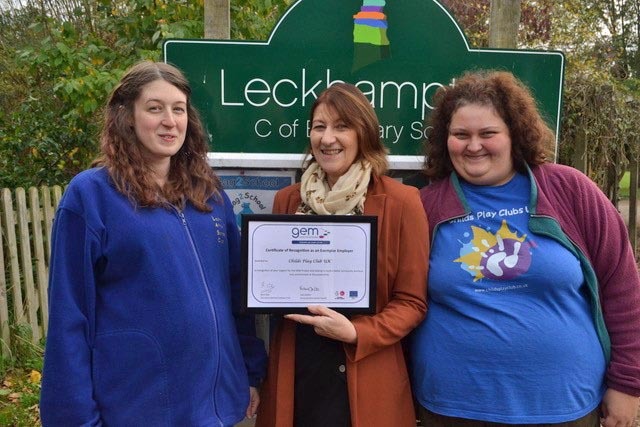 Stroud Valleys Project is the first GEM Partner to become an Exemplar Employer. They have provided numerous volunteering opportunities for individuals on the project, including administration, marketing, fundraising and handyman positions. Stratstone Land Rover is based in Cheltenham and specialise in Land Rover vehicle sales. After working with the GEM team to support one of our GEM individuals, Stratstone Land Rover was the first organisation to become an Exemplar Employer.